Why can I see the fleet in the upper right with 57 ships? It’s outside of my scanning radius as pictured - also this is a dark galaxy so why can I see that star? Do stars actually remain on the map once they go out of range? That would make sense to me but I didn’t think that was the case - also wouldn’t the star be fogged so I can’t see the fleet in orbit? 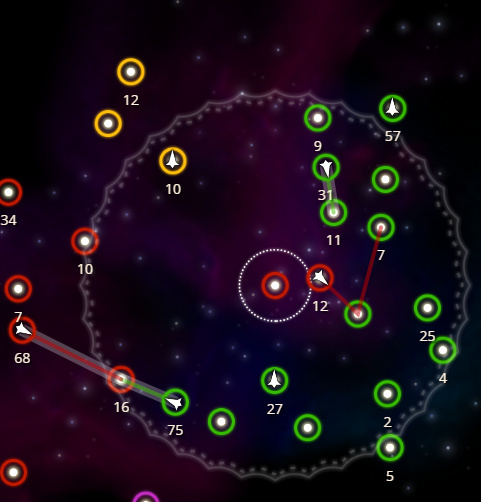 edit: the star with the 57 ship fleet and the star with the 5 ships in the lower right are within scanning range of my 12 ship fleet to the east of the highlighted star - can fleets in deep space perform scanning in dark games or something? There’s another star to the right of the one you have selected, the star with 12 ships, which has scanning range on those stars. I’m pretty sure there’s a star under those ships because of the white halo. Oops, I’m an idiot, I thought that was just a fleet in deep space! Did you change that steam review to thumbs up yet?